Devotion to the Holy Face of Jesus: The tragedy of Calvary. Part 131. The tragedy of Calvary. Part 131. The Narrative of Joseph of Arimathea has the following : " But the robber on the right hand, whose name was Demas, seeing the godlike grace of Jesus said : 'I know thee, Jesus Christ, that thou art the Son of God. I see thee, Christ, adored by myriads of Angels. Pardon me my sins, which I have done. Do not in my trial make the stars come against me, or the moon, when thou shalt judge all the world, because in the night I have accomplished my wicked purposes. Do not urge the sun, which is now darkened on account of thee, to tell the evils of my heart, for no gift can I give thee for the remission of my sins. Already death is coming upon me because of my sins. But thine is the propitiation. Deliver me, O Lord of all, from thy fearful judgment. Do not give the enemy power to swallow me up, and to become the heir of my soul, as that of him who is hanging on the left, for I see how the devil joyfully takes his soul and his body disappears. Do not even order me to go away into the portion of the Jews. . . . Before then, O Lord, my spirit departs, order my sins to be washed away, and re member me, the sinner, in thy kingdom, when upon thy lofty throne thou shalt judge the twelve tribes of Israel." If authentic, this was a touching prayer. " And Jesus said to him, Amen, I say to thee, this day thou shalt be with me in paradise." (Luke xxiii. 43.) 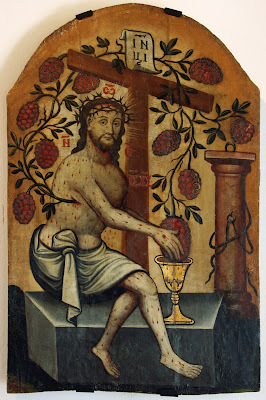 This was an example of full forgiveness at the moment of death for even a thief and murderer, as the example of Mary Magdalen was of the person guilty of immorality, while the mocking Jews tilled with pride and presumption, who knew it all, head strong in mental rebellion, stood and mocked him. While this is taking place, the executioners took his garments down to the north beside the wall, and divided them among themselves, making an equal division. They followed a custom in doing this, for the Roman law (Lex De Bonis Damnatorum.) gave the executioners the clothes of the criminals they put to death. But when they saw the seamless garment woven by his Mother, made like the robe worn by every Temple priest, without a seam, they did not like to cut it, for then it would be ruined. They brought forth a board with figures, on which, when off duty, they used to while away the time in playing games of dice, and by that they decided the one to whom it belonged, as the prophet said: " They have dug my hands and feet. They have numbered all my bones. They have looked and stared upon me. They have parted my garments amongst them, and upon my vesture they have cast lots." (Psalm xxi 17-19) A messenger then arrived from Nicodemus and Joseph of Arimathea, who informed them that he was ready to buy the garments, and the soldiers sold them in a bundle to him. Then the executioners put ladders up against the cross, and unfastened the ropes with which they had fastened the Lord's body to the cross, lest when they raised it up the shock might tear away his hands and feet from the nails. Then he hung alone by the terrible wounds in his hands and feet. The blood which had stopped by the pressure of the cords began to circulate again and flowed trickling down from his wounds. He could not raise up his head without driving the thorns deeper, for the crown of thorns would strike against the cross behind his head. He was torn with the stripes of the flagellation, and deep black and blue stripes were all over his body. 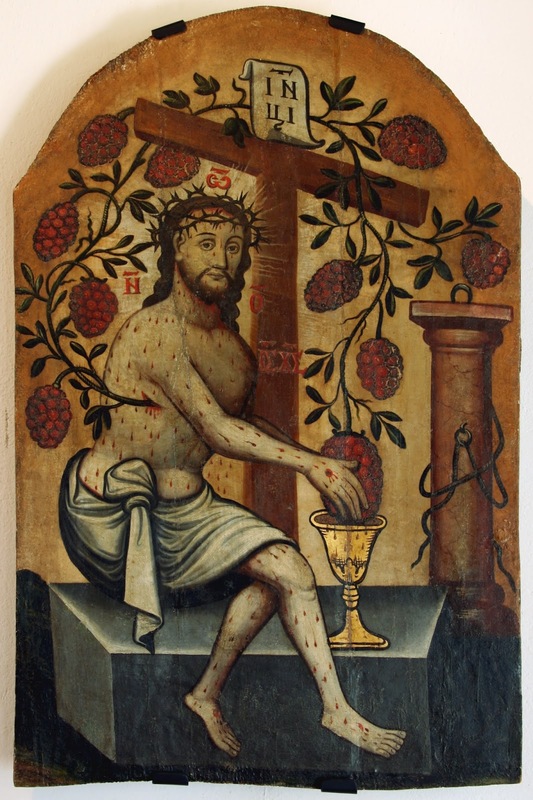 His joints were dislocated by dragging his limbs to fit the holes they had bored in the cross. In places his bones appeared. " They have numbered all my bones." (Psalm xxi, 18.) Deep black, blue and discoloured wounds going deep into the flesh covered him. His head was bowed, his eyes bloodshot, his tongue parched, his lips drawn. There was no place where his skin was whole, and there he hung on the wounds made by the nails. A band of a hundred Roman soldiers had been drawn up from the beginning around Calvary, under the command of Emelianus, lest there might be any attempt to rescue the condemned. When the prisoners had been raised on the crosses, these were relieved by a band of fifty soldiers under Abenadar, who when later converted, took the name of Ctesiphon. Under him was another officer called Casius, who, after his conversion, took the name of Longinus. The latter was a trusted messenger in Pilate's employ. These guards, under strict Roman military discipline, filed around the top of the little hill. " And they sat down and watched him." (Matt, xxvii, 36) And the four soldiers who had crucified him, having received the money for his garments, having nothing else to do, came up the hill, and entering within the wall, they sat down with the soldiers. Criminals crucified sometimes live for days, and it was the custom to guard them lest their friends might rescue them. Josephus tells us how one of his friends had been so rescued and brought back to life. "Now there stood by the cross of Jesus, his Mother, and his Mother's sister Mary of Cleophas, and Mary Magdalen. When Jesus therefore saw her, and the disciple standing whom he loved, he saith to his Mother: ' Woman, behold thy son. And after that he said to the disciple : ' Behold thy Mother.' And from that hour the disciple took her to his own." (John xix 25-27) Even in his agony, he did not forget his Mother, but provided for her a home with John he loved the most. While John was bishop of Ephesus, she lived with him till her death, which happened when she visited Jerusalem long years afterwards. The rule Providence follows is, that when persons are called to fill a position, God fills them with all the graces wanted to fit them for that state. But what must have been the graces of her who alone was the Mother of the Word of God, the Divine Son, with all the fulness of the Godhead. She alone of all Eve's daughters was a Virgin, a Wife and at the time a widowed Mother. From the very apostolic age we find records, writings, monuments, etc., showing us in what honor she was held by the Apostles. Writers try to tell that she was only an ordinary woman, but we do not find that history sustains them.